LANDSCAPE MODE: Punching out the wheels just a bit more gives performance a staggering improvement, not to mention creates the world’s first factory 72-in wide side-by-side vehicle. With 22-in of suspension travel and advanced FOX Racing components, it stretches the X3 MAX X rs’ abilities far beyond expectations. THRILLING POWER: Ready to pay your respects to the king of side-by-side engines? The precision-engineered, industry-leading triple-cylinder Rotax ACE engine pushes 172 horsepower at 7,250 RPM and 124 lb-ft of torque at 6,500 RPM for searing speed, no matter the terrain. Choose your thrill-seeking friends wisely for a ride off-road they’ll never forget. 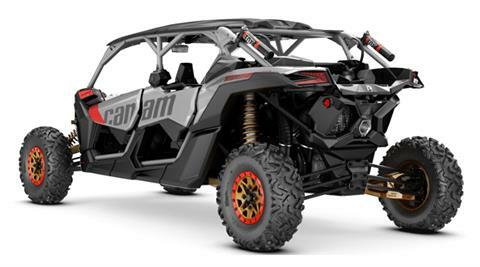 THE SMART-LOK EDGE: For next-level traction to conquer the roughest terrain, Can-Am-exclusive Smart-Lok™* technology is the new benchmark. A true full lockable on-the-fly front differential with electronically-controlled automatic modes, or with the simple press of a button that offers preset, intelligent calibrations for your type of riding. Using multiple input sources, "Smart mode” will instantaneously engage locking with the right load at the right moment. Never before have riders been given maximum traction while retaining low-speed maneuverability. *Smart-Lok was developed in conjunction with TEAM Industries, a market leader in the drive train industry. 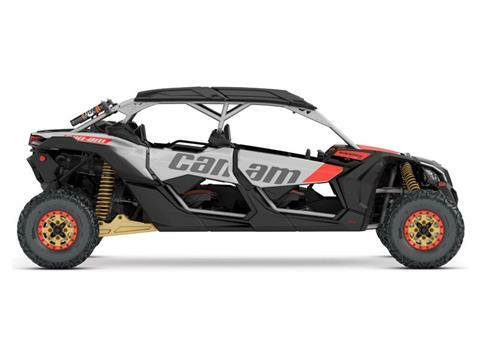 ** Available on Maverick X3 MAX X rs TURBO R Triple Black and Can-Am Red only. UNMISTAKABLY FIERCE: The Maverick X3 MAX X rs' intensity comes from a mix of performance-driven mechanical and structural design, from its signature LEDs to its advanced cockpit. Here, designers have blessed the top-of-the-line Maverick X3 X rs with an unmistakable look: in your choice of Gold & Can-Am Red or Triple Black or Platinum Satin or Triple Black & Can-Am Red (Smart-Lok). 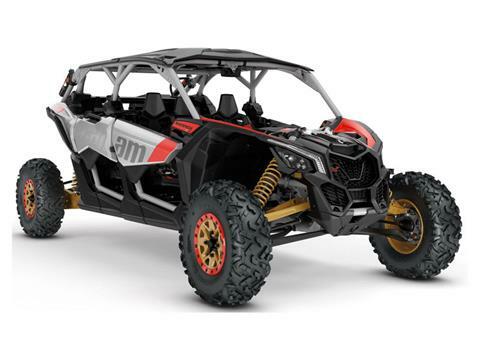 CHALLENGE IT: The Maverick X3 MAX X rs Turbo R is equipped with fully adjustable FOX 2.5 Podium RC2 Piggyback shocks with bypass and dual-speed compression and rebound (front), and class-leading FOX 3.0 Podium RC2 shocks with remote reservoir with bypass and dual-speed control at higher speeds. SERIOUSLY EQUIPPED: For extra protection, the X3 X rs Turbo R has a 4-point harness with shoulder pads, a full roof, and a heavy-duty full HMW (High Molecular Weight) skid plate honed to play hard on rough terrain. Lockable front differential with exclusive Smart-Lok * technology. True 4 modes traction system: 2WD / 4WD with front diff. lock / 4WD TRAIL ACTIV / 4WD TRAIL.